Blue tomatoes in aspic, Shreveport, a photo by trudeau on Flickr. "We still have volunteer opportunities available for June 1," says Noma Fowler-Sandlin. "We need counters, and carry-out. 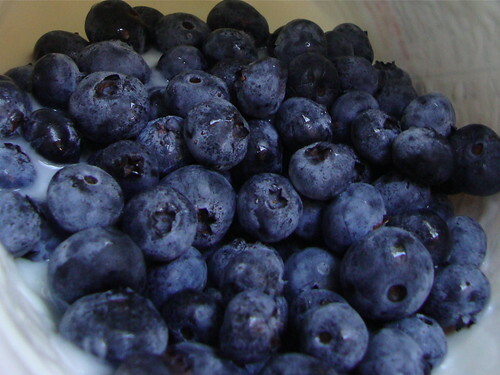 Call 455-5788, or email farmersmarket@redriverrevel.com. We'd love to have your help!" Theresa Andersson @ Bistro Byronz Shreveport, a photo by trudeau on Flickr. 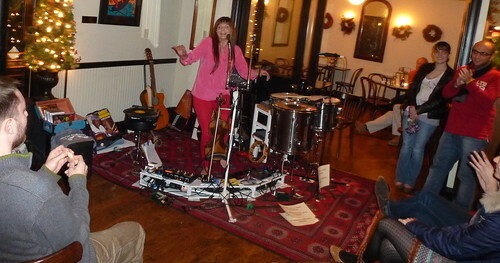 Theresa Andersson is one of the most musical beings we will ever meet. Inside her appealing head are the rhythms of Sweden, her home, New Orleans, her adopted home, and maybe even Shreveport, her Ratchet Home. Thus she frequently begins a song with drum beats. She instantaneously records the percussion patterns so that she can add melody atop the beat. Andersson's melodic tools are many: violin, guitar, record samples, fingers, and above all, voice. She can sing Euro style or she can dig in and wail, Louisiana-style. She records her own harmonies as needed (the technique is called looping). She draws her compositions from cosmic sources: Mahalia Jackson, Bobbie Gentry, Satchmo, her washing machine. Andersson's tunes are uplifting and danceable; they are simultaneously simple and complex. As a global performer - frequently touring Europe - she is accessible, warm and understanding. Her show at Fairfield Studios is highly recommended. 318 933-2514 (Please leave a message). Legally Blonde, Shreveport Little Theater Academy, a photo by trudeau on Flickr. 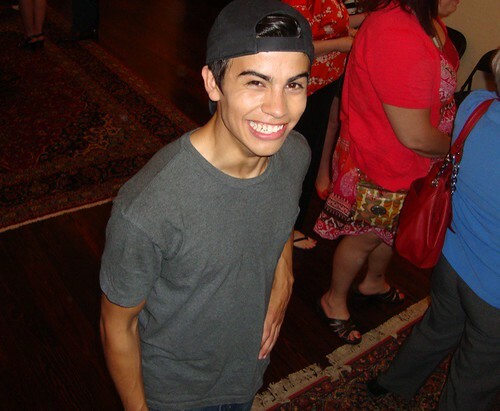 The Academy of Children’s Theatre will present the smash Broadway hit musical, In the Heights, June 7-8 and 14-15, at 7:00 p.m. at Marjorie Lyons Playhouse on the Centenary College campus, says Lauren Ross Wooley. - Directed by Cynthia Hawkins Whitaker with co-direction and choreography by Lauren Ross Wooley. Musical direction is by Daniel Ley with sets by Zac Blackwell. The cast: Adrian Gallegogos, Maddison Gilcrease, Juan Aguillar, Jan Reedy, Earleen Bergeron, Nia Savoy, Carter Whitaker, Thomas Keys, Meagan Tinsley, Madeline Wagnon and Kaelon Gerard. $15, students and $25, adults. Language not appropriate for children under 12. Susan Fontaine/Garrett Johnson wedding, The Shop, Shreveport, a photo by trudeau on Flickr. view of Schumpert from the soccer field, a photo by argiveshots on Flickr. Health care management is a monstrous job. I appreciate the difficult task on your desk. But I beg your your reconsideration in the closing of the huge Margaret Place facility. The loss of that service center and those jobs is going to be devastating to Highland and Shreveport. I hereby request that you open up a window of strategy to the effect of How CS plans to Keep Alive part of the MP facility. Your precipitous announcement of the closing (not even warning City Councilman Jeff Everson, for instance) lets the public know that you feel sheepish about the closing. Transparency in your decision making - reasons for the closing plus figures to back them up - is not something Louisianians expect. But an ethical organization ought to feel obligated to offer details to the community and its leaders. No matter how embarrassing. And there's an obligation - if you're a soulful organization, which I believe you are - to work with them to seek compromises in the revamping. Here I call upon the mayor and city council to work with CS in this transition. We are, gentlemen, all in this together. Free enterprise is not entirely free. I respectfully request a forum for the investigation of this horrendous shift of business. I hope to see city leaders and CS address this closing with options open. The zipless announcement of "We're outta here" is not good enough. Marler-Trudeau-Schumpert, a photo by trudeau on Flickr. "Definitely saddened to hear the closure of Christus St. Mary on Margaret Place," said Jeff Everson on Facebook. 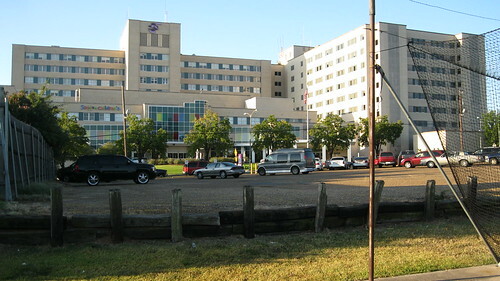 "This is a huge loss to Central Shreveport/Highland, and the NWLA healthcare sector. It sits just a few blocks from the empty and abandoned Doctors hospital. I hate to hear this." Judy Williams responded, "Christus has hired a firm, Dynamis, that specializes in helping companies repurpose buildings. They will be meeting with the community to determine community needs and hope to find new uses for the St. Mary campus." Jeff Everson: "Thanks for letting me know, Judy. As the Council representative for St.Mary's campus, I feel a little blindsided by today's announcement." Among the flood of remarks lamenting the decision, April Dahm said, "I'm tired of empty and abandoned buildings littering our city. I hope it can be repurposed and continue to be a diamond in the Highland and Fairfield neighborhoods. Sutton's Children's hospital made a horrible hospitalization for my daughter so much better. The environment alone could make a kid well again." Yoga Jai: in the park, a photo by trudeau on Flickr. 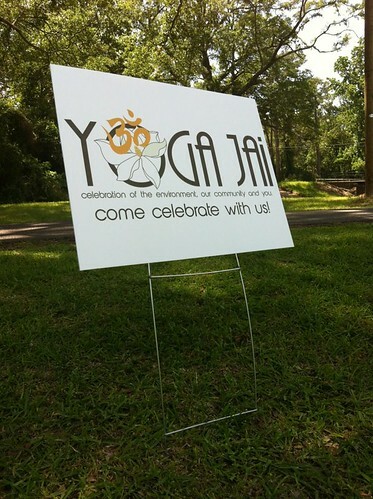 Yoga Jai would like to invite you to yoga in the park Sunday, May 26th at AC Steere at 3:00! Be sure to bring your mat, says Jill French Anderson, a water bottle, and wear comfortable clothes you can move in easily. We will have some mats available and some water. We will also have some blocks and straps! Please try to arrive fifteen minutes before class starts to get settled and ready for class to begin. We will be hosting a weekly Sunday class at 3:00pm appropriate for all ages and skill levels! But I would say the best for beginners! "Thank you, Jimmy Lynch, for making this appropriate song available to the Shreveport Dog Park Alliance. Thank you, Tom Pace, for the first public airing of this song. 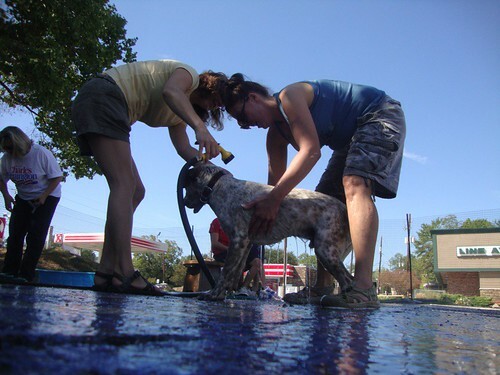 The images are predominantly from Dog Park support activities," says Marion Marks. 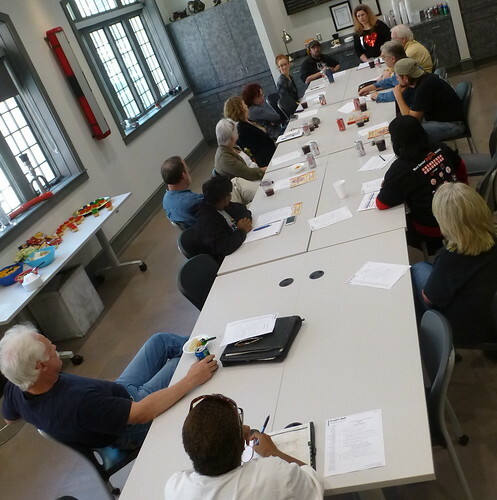 Roster Artists Meeting, SRAC, Central Artstation, Shreveport, a photo by trudeau on Flickr. SRAC's Roster Artists Meeting will be Thursday, May 23, at 4 p.m, says Vicki Marshall. 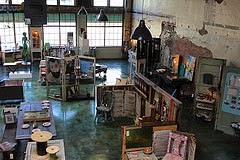 Upstairs at Central Artstation, 801 Crockett Street; 318-673-6500. If you are an accomplished artist and are interested in qualifying as a Roster Artist, see shrevearts.org or email vivkie@shrevearts.org. That includes, of course, musicians, performance artists, video-based artists, writers and more. 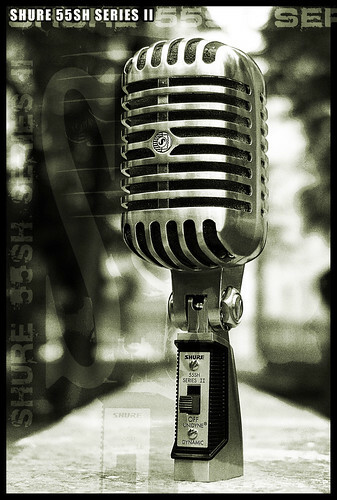 Shure (mic), a photo by XoDoS on Flickr. Katie Mook, musical director, Laura M Beeman, choreographer, David White, lighting designer & Adam Boyd, set design. Does your child have a wholesome education? How would you like to expand your child's diversity? Does your child have difficulty in their core subjects such as Math, English, Science and Social Studies? "Around the World in One Note" features a concentrated week of music study and enrichment for Musicologees (music learners) which includes a muilti-cultural study of a country and genre of music each day: Asian, African, Hispanic, European and American. There will be a culminating performance at weeks end. Enrollment is open to beginners, young musicians and vocalists. Students will have the opportunity to further their skills and love of music in a fun and supportive atmosphere. Musicology International has developed a reputation for its outstanding faculty, community atmosphere, performance and raising of educational test scores. A concentrated week of intense study and enrichment for Musicologees (music learners) includes a multi-cultural study of core subjects, geography and performing arts in correlation to Common Core Standards Curriculum. There will be a culminating performance at week’s end. Enrollment to all learners with interest in English, Math, Science, Social Studies, Foreign Languages and Performing Arts. 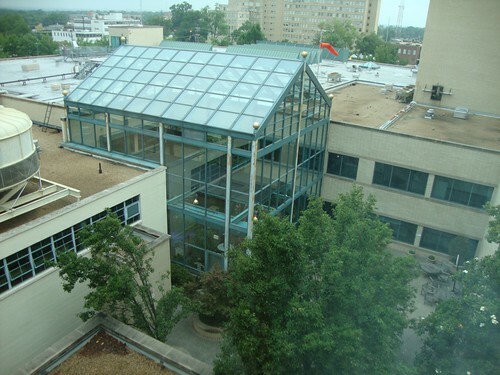 Students will have the opportunity to further their skills and love of music in a fun and supportive atmosphere at Louisiana State University-Shreveport Campus. Musicology International has developed a reputation for its outstanding faculty, community atmosphere, performance and raising of educational test scores. The mission of Musicology International is to educate, train and develop students using music as a catalyst. For the first time locally, the progressive, trademarked curriculum (Pianomatic) addresses a concept that focuses on the benefits of a diverse education —something that has proven results in raising intelligence and test scores in students. Shreveport Catalyst editors, writers, a photo by trudeau on Flickr. Shreveport Catalyst's seasonal event showcasing local artists, makers, and musicians is called a WTF Party, says Spencer Teekell. "We are documenting the events with video & photography, and uploading them to our website in a series about Shreveport's underground culture," says Christine Bradley. Event is all ages with a $5 suggested donation. CoHab is at 610 Commerce, half a block from Festival Plaza. 10:45- 11:45 Surprise Guest Rock Band in Heels. Aw, Snap, Mallori Brandon, Sarah Lyles, Heather Evans, Micah Harold. 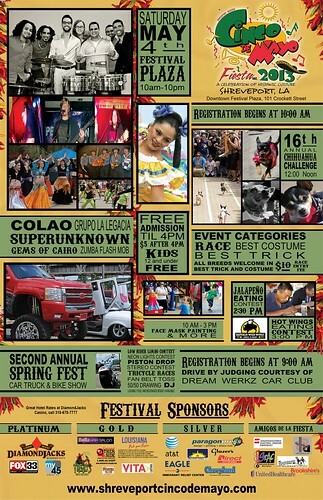 Email info@shreveportcatalyst.com for more info on how You can help! Caddo Magnet HS, Shreveport, a photo by trudeau on Flickr. 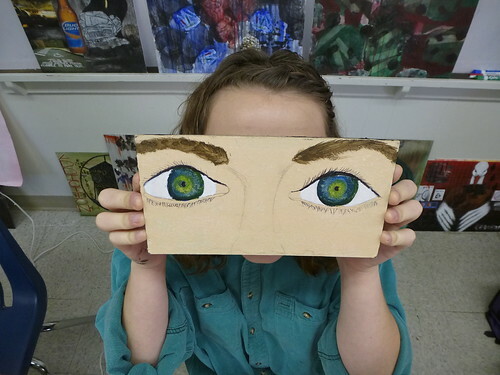 Pottery as well as paintings made by teens at Caddo Magnet will go on display at Meadows this week, says Diane DuFilho. 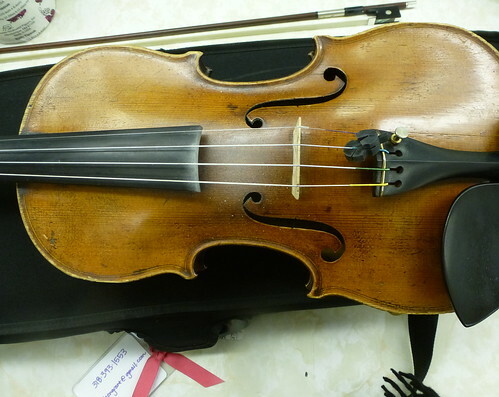 A string quartet and refreshments will bring civility to the reception on Tues, 5 to 7 pm. 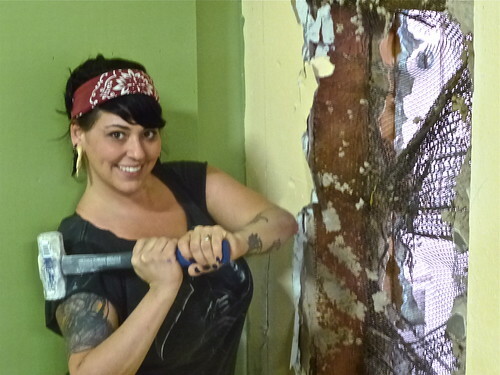 Heather Scarano, Shreveport / Olive St Thrift, a photo by trudeau on Flickr. "It's located at 444 Olive St, in Highland. The hours are 11-7. It's awesome," says designer vintage clothing maven Amy Lynn Treme. When owner Heather Scarano relocated to Shreveport recently she quickly recognized that there weren't enough thrift shops for the population. Scarano's mission at Olive St Thrift includes pet rescue. The Shreveport Symphony’s new chamber music series, sponsored by The Noel Foundation Inc., continues with a free concert featuring SSO musicians on Sunday, May 19, 3 pm, says Lois Robinson. Anderson Auditorium at the Hurley School of Music, Centenary College. It's an all-Mozart show and expected to run approximately one hour without intermission. The concert is free and open to the public, with general admission seating. 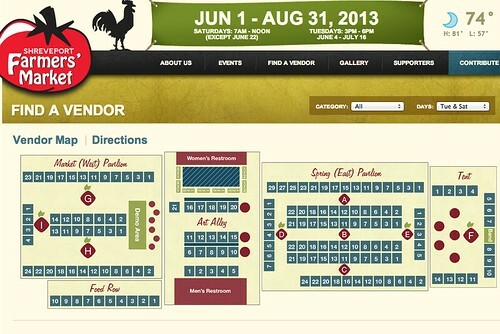 Shreveport Farmer's Market vendor map, a photo by trudeau on Flickr. "The interactive map on the website is up and running," says Noma Fowler-Sandlin. "There may still be some movement of vendors as opening day nears, but I will try to keep up with it. That will let you plan your attack!" 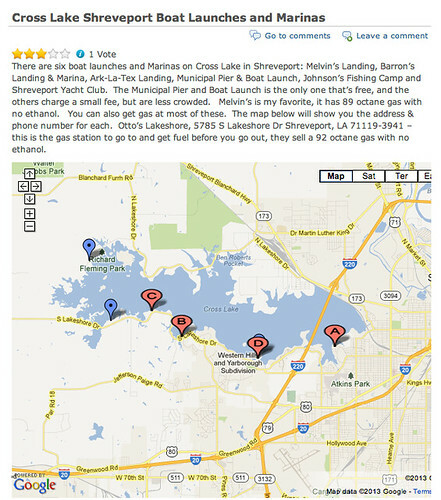 http://crosslakeshreveport.com/cross-lake-shreveport-boat-launches-and-marinas/, a photo by trudeau on Flickr. Theater review: Blayne Weaver, Jason Guy, Patrick Kirton cut in River City Rep's production of Yasmina Reza's comedy, "Art"
Blayne Weaver, Jason Guy, Patrick Kirton, River City Rep, Shreveport, a photo by trudeau on Flickr. 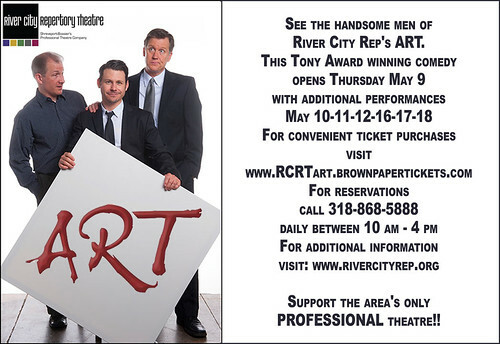 Sharply-dressed men with whip-sharp articulation reconsider their friendships in River City Rep's comedy, "Art." 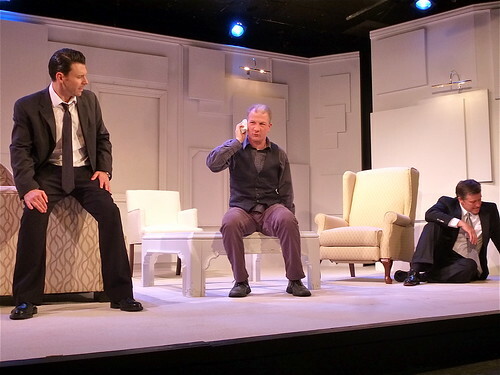 In a superb ensemble performance, professional actors Blayne Weaver, Patrick Kirton and Jason Guy brought comedy and pathos to the stage at East Bank Theater on Sat night. The brief (less than 90 mins, no intermission), action-packed and thought-provoking story about how well-educated guys make friendships was written by female playwright Yasmina Reza. Timing was rapier-sharp on Saturday as Weaver and Kirton faced off like fencers. Jason Guy's show-stopping soliloquy was acrobatic and hilarious. Performances continue Sun, May 12, 3 pm, and next week: Th, May 16, Fri, May 17 and Sat, May 18, 7:30 pm. Direction and design: Patric McWilliams. Light design, Tristan Decker; set, Jim Hayes. Tickets: $35, 318 868 588. River City Rep @ East Bank Theater, 1302 Barksdale Blvd. Easy parking round back. Brother Sun, a photo by folktraveler on Flickr. 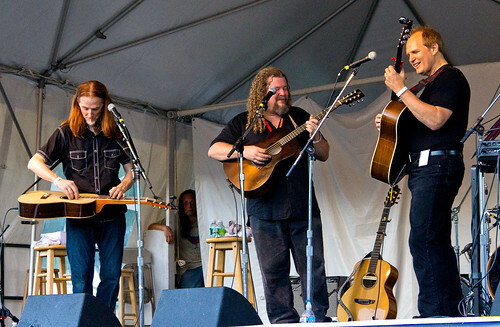 "National touring artists Joe Jencks, Greg Greenway and Pat Wictor have made their mark as veteran touring singer-songwriters. Fusing folk, Americana, blues, pop, jazz, rock, and a cappella singing, Brother Sun is an explosion of musical diversity and harmony, in the finest of male singing traditions," says their kit. Reservations: shreveporthouseconcerts.org, reservations@fairfieldstudios.com Or 318 933-2514 and leave a message. Art Email Promo, a photo by trudeau on Flickr. The comedy "Art," which raises questions about art and friendship, concerns three long-time friends, Serge, Marc, and Yvan, says Wikipedia. Serge, indulging his penchant for modern art, buys a large, expensive, completely white painting. Marc is horrified, and their relationship suffers considerable strain as a result of their differing opinions about what constitutes "art." Yvan, caught in the middle of the conflict, tries to please and mollify both of them. 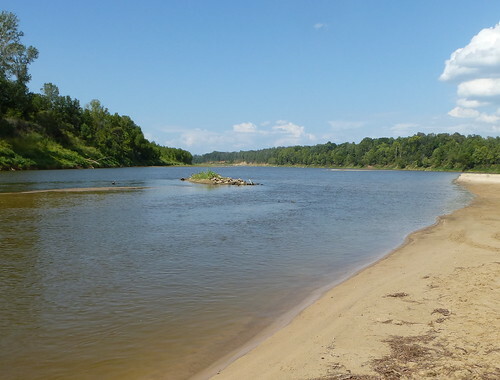 the Red River, Bossier Parish, looking north, a photo by trudeau on Flickr. "Mud" is a new Matthew McConaughey-Reese Witherspoon movie set on a river much like the Red, in the woods much like those of Bossier and Caddo. A compelling adventure reminiscent of Tom Sawyer or Huck Finn, the movie features 2 well-directed teens and a cast of characters evocative of people in and around Shreveport. McConaughey is superb as "Mud," a guy who, for all his warmth and wisdom, has maybe 50% of life down tight. The young teens, Ellis and Neckbone, are somehow as characterful as the adults. For many the movie "Mud" will be a vivid reminder that unvarnished stories about redneck life in the hackberry and sycamore woods of NW Louisiana can be powerfully affecting. Of course, the key to making valuable entertainment, whether the tale takes place under the Dupont Fish Market or is set in and around the Hilton, is the writing. The young writer-director of the movie, Jeff Nichols, is a lad that, said the NY Times, "Came into an undergraduate program having read almost all of Faulkner and Cormac McCarthy." Nichols apparently knows his Mark Twain and Eudora Welty inside and out, too. Samuel's ladder, Alan Dyson, 2013, a photo by trudeau on Flickr. "'Tablet' - improvisations with god - is a collection of new work made from construction materials - limestone panels, brick, dimension lumber, and paper," says multi-media artist Alan Dyson. "Some materials, saved for years, bear the traffic marks of weather, vegetation, and mineral stains which i have responded to with watercolor, marker, and etching tools. The result is reminiscent of my daily piano improvisations - carefully, but randomly balanced, colorful and fun." "The signature piece of the show," Dyson adds, "is a structure I am calling "Samuel's Ladder". 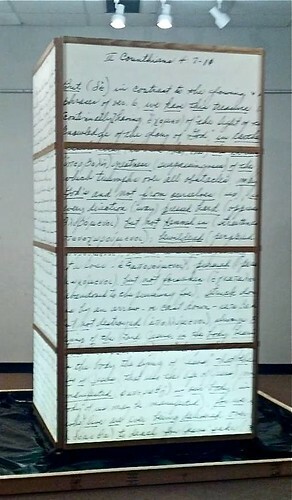 It's a tower built like shoji screen panels - clad with photocopy enlargements of my father's hand-written sermon notes. It is illuminated on the inside much like a Japanese lantern. The sermon, from Corinthians, and the limestone panels bearing the marks of nature are the inspiration for the title 'Tablet'." "This new collection utilizes the materials of my work as an architectural artist but feels like my musical meditations...only in stone, brick, and wood." East Bank Gallery, Bossier Arts Council, 630 Barksdale Blvd, Tues-Sat, 11:00 am-6:00 pm or by appointment. 318-741-8310. May 4: Cinco de Mayo Shreveport, a photo by trudeau on Flickr. Lake St Dance Hall music schedule, May, 2013, a photo by trudeau on Flickr. 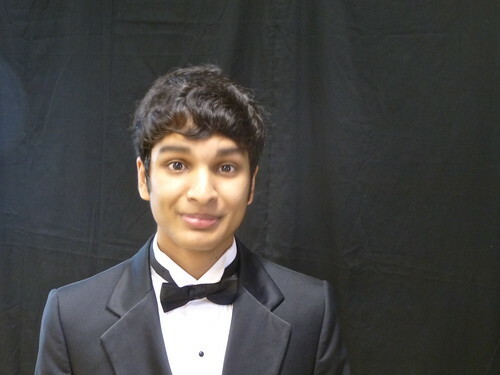 Caddo Magnet Orchestra soloists: Sean Nathan, a photo by trudeau on Flickr. 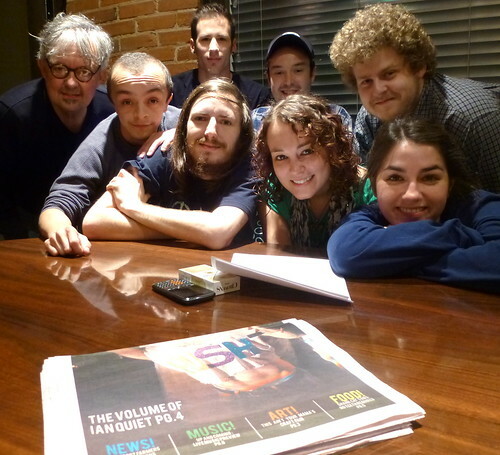 Winners of the 2013 Young Artists Competition have been announced by Red River Radio. They will perform Sun, May 5, at 4 p.m. at the LSU Shreveport University Center Theater, says Kermit Poling. Works to be performed include selections by Ravel, R. Strauss, Kabalevsky, Sarasate, Brahms; and the song "A New Life" from Jekyll and Hyde. The 4 Shreveport-based performers attend Caddo Magnet. "The concert is free and open to all. Come share in their music and support these young artists. The concert will be recorded and broadcast at a later time," added Poling.